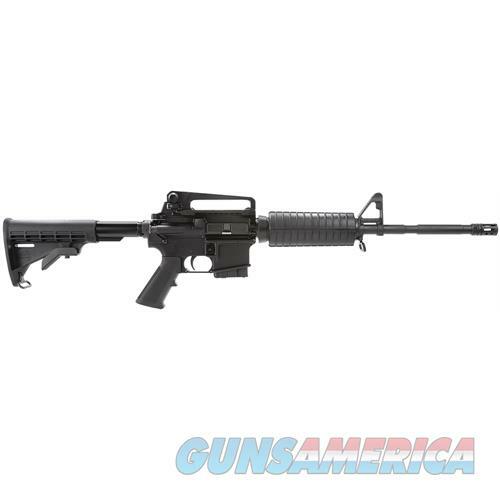 Description: WINDHAM WEAPONRYMPC RIFLE STATE REGULATED•Semi-auto gas impingement system •Hardcoat black anodized 7075 T6 aircraft aluminum receivers •M4A4 type flattop upper w/removable A4 aluminum carry handle •Aluminum trigger guard •Carpenter 158 steel bolt •Chrome-lined 4150 Chrome Moly Vanadium 11595E steel barrel M4 profile •Welded muzzle brake•M4 feed ramps •1:9 RH twist •Front Sight: Adjustable height square post in A2 standard base •Manual safety lever •Fixed-position M4-style stock •A2 pistol grip •M4 double-heatshield handguard •Includes hard gun case w/black web sling (1) mag. •OAL: 36.125" (extended/fixed) 32.375" (collapsed) •Wt. : 6.85 lbs.